This is a comfortable stage. Pilgrims will pass through small hamlets of rural Galicia and discover magical stretches through native forests. The main danger, both for walkers and cyclists, resides in the junctions that have to be faced with the travelling companion of the N-550 road and the railway line. After crossing the bridge of Burgo, now at the other side of the Lérez, pilgrims bid farewell to Pontevedra. The exit is well signposted. From the church of Alba pilgrims face a short yet dangerous stretch on the road, without the aid of a pavement, until reaching Alba, where they will find the chapel of San Cayetano. Hikers soon abandon this road, at the well sign posted junction, towards Cerponzóns. From this point walkers begin on one of the most beautiful stretches of the stage. A stunning forest dominated by native species such as oak trees. 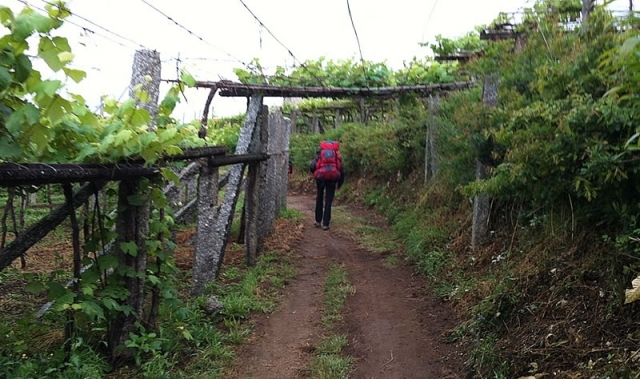 Walkers have to re-cross the railway track (extreme caution) to head towards San Amaro, now in the council of Barro. In this location they can have the credential stamped at the café/bar A Pousada do Peregrino, at the restaurant Mesón Don Pulpo or at the parish church, at the foot of the Camino. At the exit of this tiny hamlet there is a recreational area with a fountain, benches and a stone cross. From here walkers descend to a larger road and at the other side of it they will find the albergue of Barro. Continuing along an earthy and gravel path, now in slight ascent and surrounded by vines, hikers arrive at the bar A Eira. After another short stretch on asphalt pilgrims reach the village of Ponte Balbón. This is one of the best sign posted stretches of the whole Camino. After leaving a farm on the right hand side, walkers have to cross the road that leads to Meis to then continue to Caldas and later reach, once again the N-550, and a sign indicating that there remain 40 kilometres to reach Santiago. A little further ahead the Camino leaves behind the cars to entre among cornfields and the vineyards of the neighbours of Briallos (in the council of Portas). In this last location there is a small supermarket. The pilgrim albergue, well sign posted, is situated half a kilometre from the Camino. A comfortable stroll among grapevines combined with stretches on earthy ground and asphalt, with the addition of numerous fountains and stone crosses. After passing through the village of Tiro walkers reach the gateway to the location of Caldas de Reis, which is accessed via the N-550.